On Jan 6, 2015 Margaree Salmon Association (MSA) attended a Recreational Fisheries (Striped Bass & Salmon) Advisory Meeting for the Southern Gulf of Nova Scotia. The meeting was organized by the Department Of Fisheries and Oceans (DFO) and was held in Margaree Forks. At that meeting MSA volunteered to participate in upcoming research activities concerning a diet study of Striped Bass in our region. During 2015, DFO have decided to proceed with the diet study and we have had the opportunity to participate. The goal of this project is to angle and retain 30 or more striped bass per month from the Margaree area. Our participation in this project differs from the DFO Kelt project in that we cannot recruit and licence a large number of anglers to fish throughout the area. DFO staff must be on-hand to kill and store each bass as it is caught. We had a team of 25 anglers fishing for kelt salmon. We typically have six or less to fish stripers. On June 5, 2015, we had five anglers and DFO Technician Renelle Doucette fish the tidal waters of the Margaree River. We used fly fishing equipment and spinning gear. We did not catch or see any stripers. As of June 05, we were unaware of any stripers being caught in commercial nets or traps in the area. We renewed our efforts June 18 (Thursday) and the morning of June 19 (Friday). We had seven anglers participate. Renelle Doucette, DFO Moncton was again on hand to coordinate our efforts. We fished the Lower Tompkins and Seal Pools on Thursday evening for approximately two hours and retained 36 striped bass. The stripers were relatively small measuring 30 cm – 40 cm. There was also one salmon released in the Tompkins by another angler. As we retained more than 30 stripers, fishing Friday was not necessary. The evening of July 28 and morning of July 29 we fished stripers at Margaree Harbour using spinning gear. Dr. Cindy Breau and DFO Technician Gilles Paulin were on site. There were not many stripers seen by anglers, so we kept our group relatively small in numbers – 3 Anglers and 2 DFO staff. We caught 13 stripers, again measuring 30 cm – 40 cm. We will be fishing again during August and September. Results of the stomach contents research will be shared as it becomes available. Just a note concerning fishing efforts August 24 & 25. We had three anglers ( Greg, Leonard, & myself) participate. We are keeping the number of participants small as we cannot spread out along the river. We must be accompanied by DFO staff to retain stripers. Gilles Paulin, DFO Moncton was on hand to coordinate our efforts. We fished the Grand Etang Harbour the evening of the 24th and retained 8 stripers. 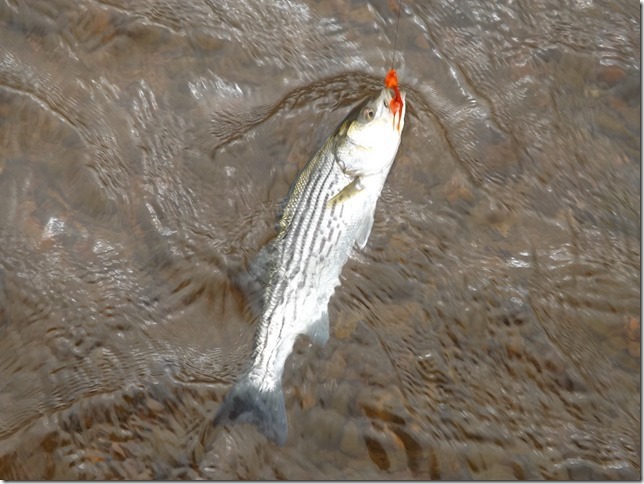 The morning of the 25th, we fished Margaree Harbour and retained more than 30 stripers, mostly caught by fly fishing. We anticipate working with DFO on this research project again, probably in mid/late September. Our annual general meeting is Oct 9, 2015 7PM at St Patrick’s Hall and our dinner auction is Oct.10, 2015 starting at 6PM at the same venue. At these events, new members are welcome to join MSA and existing members can renew their membership, you may also renew by visiting the MSA Membership page.